If you need to water the plants in your garden or backyard and all you have is a hose, you’ll probably still be able to do the job. However, trying to water different kinds of plants effectively with just a hose is pretty tough, and you might even end up damaging some of the plants by awkwardly directing powerful water flow at them. If you invest in a good garden hose nozzle, you’ll no longer have to experiment with water pressure and shape the hose with your fingers to get a gentle stream of water. On the other hand, you probably already have a couple broken or malfunctioning garden hose nozzles laying around in your shed, and you may have no desire to further waste your money on things that are not going to serve you for long. We understand that, so we have reviewed dozens of different garden hose nozzles to find out which ones are going to offer you the best value for the money. Here are the 12 best garden hose nozzles. This is a basic trigger-type nozzle that won’t cost you a fortune, and admittedly, it probably won’t last you a lifetime. Still, it’s a good nozzle that is more than enough for watering a small garden that doesn’t have any exotic plants that require special care and intricate watering patterns. You can water larger plants using the hard jet mode and switch to the fine mist mode if you need to water delicate plants or flowers. You can also use the fine mist spray pattern to clean medium-sized objects. Overall, this is a compact nozzle model that’s extremely easy to use. It offers a comfortable grip and is definitely going to last you for a while, so it’s a great choice for a minimalist gardener. You can pick this model up for less than $12. This is another entry on our list that won’t cost you a lot more than several cups of coffee, which is not necessarily a bad thing. If you’re only going to use your garden hose nozzle occasionally, you may not want to get an expensive model with lots of features that you won’t be using anyway. Enter the Gilmour 100-PSI garden hose nozzle that is a trigger-style model with all the necessary features and nothing more. You can control the intensity of the water stream with a dedicated dial, which makes this nozzle fairly flexible. You don’t need to constantly squeeze or press something on the nozzle to keep the water flowing, which is definitely an advantage for long watering sessions. Finally, you can attach cleaning tools to the output of this nozzle, which may not be a feature used by everyone, but it’s still a nice addition to the nozzle’s functionality. Look to pay between $10 and $12 for this nozzle. When you see “ultimate” in a product name, you know it’s either going to be a marketing ploy or a truly amazing product. It is definitely the latter in case of this Bonaire hose nozzle, as it is an extremely durable and well-made product that will likely last you for years. This nozzle combines plastic and metallic elements to achieve maximum reliability and efficiency, only allowing stainless steel components to come into contact with water. This means that the Bonaire nozzle can last you a lot longer than most plastic models. The nozzle has five different patterns that can be handy in various use scenarios, so you can also do some cleaning or wash your car using the Bonaire HN-10C. This nozzle is a little more expensive, coming in at around $35. If you’re not ready to pay that much for a garden hose nozzle just yet, but you really like the design and functionality of the Bonaire HN-10C, you may want to purchase this JF Mall nozzle. The spray patterns on this nozzle may not be as versatile, and you might have a harder time watering delicate flowers, but this product still does offer a lot of bang for your buck. The brass interior of the nozzle won’t deteriorate even after lengthy contact with water, allowing for impressive durability that’s normally expected from more expensive products. The rubber exterior parts of the nozzle provide a great grip, so your hands aren’t going to get tired handling the hose even if you need to water a large garden or lawn. It’s also less expensive at $20 or lower. This garden hose nozzle looks impressive, so you’re bound to have some pretty high expectations for it from the very start. As it turns out, this Spray Tech product might even exceed your expectations since it’s offering such a great mix of reliability, ergonomics, and flexibility. You can choose from a whole lot of nine different spray patterns, which are a lot given that this nozzle is not even the most expensive item on our list. The body of this Spray Tech nozzle is 100% metal, which allows it to withstand encounters with the elements as well as powerful water streams. This means that it will likely serve you for years, and you won’t even have to constantly remove it from the hose to bring it inside (although a little care and maintenance still won’t hurt). It’s yours for about $25. If you’re looking for an affordable garden hose nozzle that also offers a lot of flexibility, this VicTsing nozzle might just be up your alley. The plastic body of this product allowed the manufacturer to cut down on costs, but VicTsing didn’t have to compromise the quality of the nozzle. Of course, you probably don’t want to leave this nozzle our in the sun for too long (and don’t even think of leaving it outside in subzero temperatures), but if you take good care of this nozzle, it is definitely going to serve you well. The available spray patterns are all different enough that you have a great deal of flexibility when choosing how to water different plants with this VicTsing garden hose nozzle. This model falls in the $10-15 range. Just keep rotating the dial on this hose nozzle, and you’re bound to find a setting you like at some point. With eight different spray patterns, you won’t be limited to just one or two modes, which might not be suitable for what you need to do. The water adjusting system on this nozzle is very effective and easy to use, making it even more versatile. The ergonomic grip is provided by high-quality rubber that won’t slip out of your hands even once it gets wet. As a bonus, the combination of green and black colors looks really cool and will be easily noticeable on most backgrounds. This nozzle sprayer offers a lot of value for your money without sacrificing longevity, so we decided it deserves a spot on our list. It’s priced at around $12. How about getting two awesome products for the price of one? If that sounds good to you, take a good look at this garden hose nozzle set from Rottay. The first unit comes with eight spray patterns for gentle watering and flexibility, while the second one produces a powerful jet of water that can be used to wash cars at higher water intensity. If you dial down the water flow, you can even use the second nozzle to wash your pets, which is a nice additional bit of functionality. If you need to water plants in hanging pots on a regular basis, this is the hose nozzle for you. Being 30 inches long, it allows for easier access to spots that are very difficult to reach with your good old garden hose and even with most nozzles. 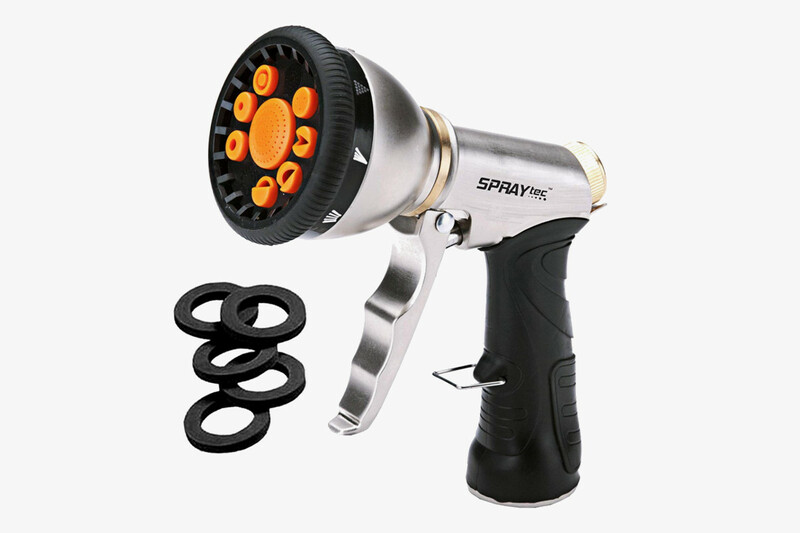 The spray head has seven different patterns with an easy system for switching between them. The valve used in this model only requires a single touch to start spraying water, which is very convenient if you have to water lots of plants in one go. This nozzle is also available in a shorter, 16-inch option. True to its name, the Kaleidoscope nozzle comes in a multitude of fun, bright colors that are going to make gardening even more enjoyable. Buy it for less than $30. We said we were only going to include garden hose nozzles here, but what if you need to water a dozen trees on a regular basis? This garden hose nozzle from Orbit has the “XL” in its name for a good reason. It can be attached to a fire hose to provide an extremely powerful jet of water which is probably best not used on plants unless you’re dealing with something truly gigantic. However, once you attach it to a regular garden hose and curb the intensity of the water flow, you get a great tool for watering large bushes and trees in your backyard or garden. The metal body of this nozzle will resist corrosion for a long time, while the ergonomic rubber grip will feel comfortable even in large hands. This model usually costs a little more than $25. We’re once again including a 2-for-1 bargain in our list, because why wouldn’t we? The price for this set of nozzles may not be that low, but this is a high-quality product that will last you for ages simply because you’re getting two nozzles instead of just one. This is handy if you use multiple garden hoses simultaneously or if you simply want to have a spare nozzle lying around in case you need an extra one or your old one gives up the ghost. 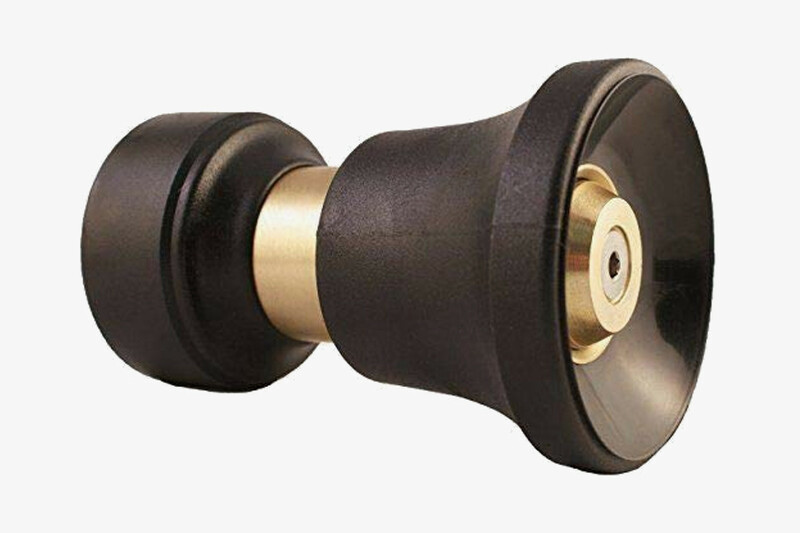 The nozzles are simple but well-made, with quality rubber grips and solid construction. You’ll get a package of two nozzles in random colors, which adds a certain degree of fun to something as casual as buying a garden hose nozzle. Get both nozzles for less than $30. The final product on our list is a great deal if you want straightforward functionality that’s not wrapped up in unnecessary features just to take more money from you. A reasonable price tag and eight spray patterns to choose from make this nozzle a good choice for many gardeners, regardless of their watering habits and needs. You can twist the knob at the back of the nozzle to regulate the amount of water passing through, which gives you even more control and flexibility. The rubber grip is pleasantly soft to the touch, and yet it is not going to fall apart after a month or two of regular use. This is another fairly low-priced model in the $10-12 range. If you just glance at the sheer amount of garden hose nozzles that you can buy in specialized stores and online, you may instantly get lost in the variety of shapes, materials, and features. Fortunately, you don’t have to go through the hassle of reviewing dozens of options to pick five or six nozzles that you think would work best for you. Now that we’ve present our top 12 garden hose nozzles, let’s discuss the criteria we used to select the best products. Most garden hose nozzles are made from two main components, the sprayer and the handle. The handle is often made of plastic, while the most common material for the sprayer is metal. However, some models are made completely from metal, while others include other materials for improved reliability and efficiency. Some cheaper garden hose nozzles are made from nothing but plastic, and we recommend that you steer clear of such models because they are highly likely to start leaking after as little as several months of use. Next, there are different hose nozzle grip styles to consider. The pistol-type grip is one of the most common styles, combining ergonomics with a great deal of flexibility. Bear in mind that pistol nozzles usually contain many small moving parts that might get damaged quickly if you choose a poor-quality product. If you want something less complicated and more straightforward, you can consider cylindrical, fan, or fireman nozzles. These nozzles are pretty easy to use, they’re mostly reliable, and they provide a decent amount of flexibility so that you can use them to water multiple types of plants. Avid gardeners may want to get a dial nozzle to have quick access to numerous spray patterns that can be instantly switched to one another. Dial nozzles are often made from plastic, which makes them a little less durable than other nozzle types, but that shouldn’t be a problem if you get a high-quality product from a reputable manufacturer. Finally, take a look at the watering wand nozzles if you often need to water plants that are hard to reach. This nozzle type works great for large flower beds and hanging baskets. Last but not least, there are some technicalities to consider. Depending on what garden hose you have, you’ll want to get a nozzle that fits the diameter of the hose and can be attached to it. Some nozzles come with the quick connect feature that allows you to quickly attach them to the hose without fumbling with the traditional connectors every time you use the nozzle. If you use your garden hose on a regular basis, you may want to invest in a nozzle that comes with at least two spray patterns so that you can adjust it for different use scenarios. Each of the 12 garden hose nozzles we reviewed above will help you water your garden quickly and efficiently. We hope that our guide will help you choose a garden hose nozzle that will be a welcome addition to your arsenal of gardening tools. If you just can’t decide what nozzle you need, we recommend that you go for one of the dual nozzle sets because they are extremely versatile.